I don't know how this game is constructed as I don't have the brains to understand such things but what I do know is that it isn't just simply "plotting". And I don't have the brains to understand what Andy's plot functions are doing. Never thought of that, but it could of course be done by putting the appropriate graphic characters on the screen. - Buil a ZX80 version of the game. The zx81plot.h functions probably need to be modified for this. - Is there already any ZX81 network game out there? We could add ZeddyNet network support to the game. It would only need to constantly poll the other player's x, y and direction variables via ZeddyNet (EDIT: and send its own three values over the net). But I don't have the hardware yet nor do I have the knowledge how to do the ZeddyNet communication. Maybe I will ask over at the German-language sister forum, they seem to be very active with ZeddyNet there. Last edited by RobertK on Sun Mar 04, 2018 2:27 pm, edited 1 time in total. Is there already any ZX81 network game out there? 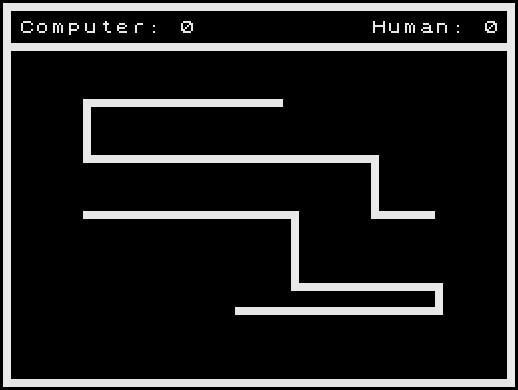 I think this Game would be the Best Game to play online with two ZX81. But I´m not a programmer (my only Game is in BASIC and I had a lot of help from Andre*** - see below)... so maybe you can do it?? Next weekend (9.-11. March) the 22.ZX-TEAM-Meeting will take place near Fulda/Germany. We will be online via Webcam and Chat. Maybe we can make some plans there?! Last edited by zx81jens on Sun Mar 04, 2018 5:03 pm, edited 1 time in total. eyerything will be okay in the end. if it´s not okay, it´s not the end. If have seen that Siggi has written some z88dk ZeddyNet libraries, so he definitively knows how to code in z88dk and how to use ZeddyNet. And my game code is rather simple and hopefully well-documented, so in theory it should be possible to join our forces and try this. However, I have no idea if the speed will be sufficient to play such an action game over the net without delay. I worked on the character choices for this type of plotting. Ill find and post what I have so far. @Andy: very clever! I never thought that it would work that way. Thanks once more! so we set and unset the character code bit2, bit1 and bit0 which directly represent the aformentioned quadrents. I only setup lookup tables for directions 1(North) counterclockwise to 8(315deg). Note: Usability of the two-player-mode is currently very limited on all systems other than the ZX81 because the status of two buttons cannot be checked simultaneously. Maybe future z88dk versions will allow this on at least some other systems (according to the z88dk team, it should be technically possible for at least the Jupiter Ace). And what about the ZX80 version that we are all waiting for? Well, it is basically complete and working, but I still couldn't get it flicker-free. I have done what in theory needs to be done, but the screen still flickers heavily, so I will need some assistance on the z88dk forum. Last edited by RobertK on Mon Jun 25, 2018 11:36 am, edited 1 time in total. I used a plot in my hidden pictures. Bit 4 was set with a xor 135. I was planning a snake-like game to be written with my universal library CrossLib. You could do it before me. abstract commands (whose implementation will depend on Z88DK, CC65, CMOC, GCC or any other C compiler).